Michael Phelps, the most decorated swimmer of all-time, his long time coach Bob Bowman, and Aqua Sphere, the premier swimming equipment manufacturer for fitness swimming and triathlons, have launched a new web site www.mp-win.com which gives swimmers the chance to win instant prizes of MP swimming gear and enter a sweepstake for larger prizes. Celebrating an incredible career for Michael Phelps, “MP Win” is the creation of the MP swimming brand, the partnership between Phelps, Bowman and Aqua Sphere. From now until October, the public are invited to click on www.mp-win.com and try their hand at a fun scratch card game where they have the chance to win superb instant prizes of MP kit plus entry into a sweepstake for the chance to win a Grand Prize of an XPRESSO competitive race suit, XCEED goggles and X-O cap and runner up prizes of MP training kit and XCEED swimming goggles. No purchase necessary. 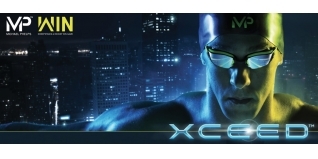 Extremely lightweight yet highly robust and flexible, the XCEED goggle is, according to Michael Phelps, “The best goggle I’ve ever used.” The XCEED leverages Aqua Sphere’s patented curved lens technology to offer perfect clarity and an expanded field of vision. Engineered with Exo-Core technology, the goggle combines two materials for maximum performance while offering stability and durability. The ultra soft anatomic Softeril gaskets provide a watertight seal with an exceptionally comfortable fit. Phelps adds “When I’m competing outside, I’ve always had a hard time sighting the lane lines. With the XCEED goggle, I can see two or three lanes over. The visibility is insane. I’ve never worn anything like it”.